Keeping gutters clean and free of leaves, trash, and any other material is essential. If left unattended, clogged gutters can result in rainwater collecting in the gutters and then flooding on the roof. If this occurs, it can result in extensive and expensive water damage. Cleaning gutters is often a tiresome and dangerous task. In order to get to the right area, an individual is supposed to acquire a tall ladder, and then the leaves and trash from the gutters will lead to another mess on the ground. Due to these reasons, it is common for homeowners to turn to professional gutter cleaners like Midland Gutter Pros. Our company is situated in Midland, Michigan and has serviced the residents for over ten years now. At Midland Gutter Pros, we have the skills and experience to effectively and safely clean your commercial or residential property’s gutters. We give our customers low prices alongside free firm quotes. As a standard rule, most professionals recommend that gutters be cleaned twice a year. However, it would be wise if you considered cleaning your gutters four times a year especially if a lot of trees surround your home. Those homeowners who have pine trees on their buildings will be required to increase the number cleaning every year because pine trees tend to shed their leaves regularly all year round. You may notice that your gutter needs some cleaning if you realize excessive pine needles or leaves are clogging gutters, birds nesting on the gutters or animal presence, plants growing in the gutters, gutters visibly damaged or sagging, and water is leaking from the gutters when it is raining. When it comes to expertise gutter cleaning services, turn to Midland Gutter Pros. We boast the latest gutter cleaning tools and gutter cleaning equipment to handle the gutter cleaning requirements of all size and types of properties. Our staffs are ready to work with you irrespective of the size of your building. We work safely, efficiently and quickly and all our crews are bonded, insured and bonded for your peace of mind. Often, the cost of cleaning gutters will be founded on some factors such as the size of the house as well as the number of stories on the house. Additionally, if the gutters are extremely clogged due to neglect, the cost may shoot upward due to the additional time and effort taken. 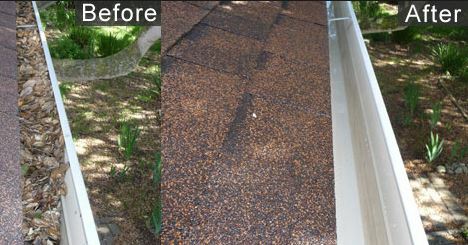 Apart from cleaning out the debris and leaves that clog your gutter, we also bag the waste and flush the whole system. Removal of the debris from the gutters will be included in your quote. Lastly, since cleaning gutters regularly can be a tedious and expensive task, one should consider installing gutter guards. With gutter guards, leaves that fall from the trees will not find themselves inside the gutter system. Therefore, if you need gutter cleaning services, drop a call to our customer support now.